Wilmington, Delaware - MyClickApps LLC., a burgeoning mobile applications developer, is excited to announce the launch of Contacts Duster Pro for iPhone, iPad, and iPod touch devices running on iOS 5.0 or later. Following up the recent release Contacts Duster 3.1 - the app's newly updated free counterpart - Contacts Duster Pro steps up as the most practical and well-rounded contact management and clean-up utility available on iTunes today. This useful app lets users clean up duplicate info on their devices, merge information for specific contacts into a single entry, delete or share their contacts, and more all from a single place and in mere moments. The perfect mobile tool for app shoppers looking for an intuitive and hassle-free solution to streamline their OS contacts list, Contacts Duster Pro is currently available for download on the Apple App Store for $2.99 in the Utilities category. Contacts Duster 3.1, a free, limited feature version of the app is now available in the App Store's Free Utility Apps section as well. 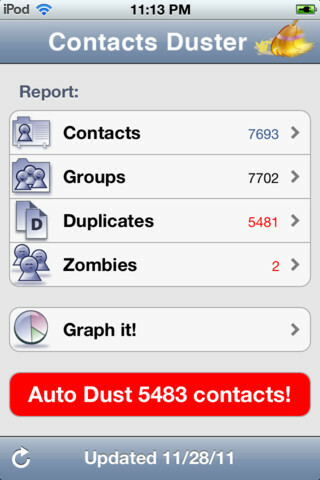 With past incarnations of the app already praised and embraced by iOS app shoppers worldwide, Contacts Duster Pro brings users enhanced and refined versions of all the contact management features they love as well as instant access to the app's unique contact group management system. Featuring newly enhanced software, the app analyzes every bit of contact information stored on a user's device more accurately and seamlessly than ever. Users simply review Contacts Duster's reports (offered in both list or graphed forms), select the info needs to be organized, deleted, or merged, and get the job done with a few quick taps. Contacts Duster Pro doesn't simply make iOS address book maintenance easier than ever before, it allows users organize their contacts and bundle them into different groups with ease as well. This lets users organize their contacts by social groups such as co-workers, friends, or family members, and never scramble to find the number they need again. This contact groups management capability is strongly limited in Contacts Duster 3.1. No worries though - once users make the decision to step up their experience they can upgrade to Contacts Duster Pro, unlock this awesome feature, and say goodbye to distracting internal adds instantly via in-app purchase without ever leaving the app or disorganizing their address books. Contacts Duster Pro 1.0 is $2.99 USD (or equivalent amount in other currencies) and available worldwide exclusively through the App Store in the Utilities category. Contacts Duster 1.0 is also available for Free. Founded in Wilmington, Delaware, MyClickApps LLC is an international mobile application development and publishing company. The organization is committed to creating useful, innovative, and practically designed apps for tech savvy consumers that are eager to utilize their mobile devices to their utmost potential. (C) MyClickApps LLC 2012. All Rights Reserved. Apple, the Apple logo, iPhone, iPod and iPad are registered trademarks of Apple Inc. in the U.S. and/or other countries.